In 1957 Dr. Seuss was enjoying what Neil Tennant of the Pet Shop Boys would describe as his ‘imperial phase’. The Cat in the Hat had just changed how children learn to read forever, and another masterpiece, Green Eggs and Ham was to follow. In between came his Christmas book, and it was every bit their equal. 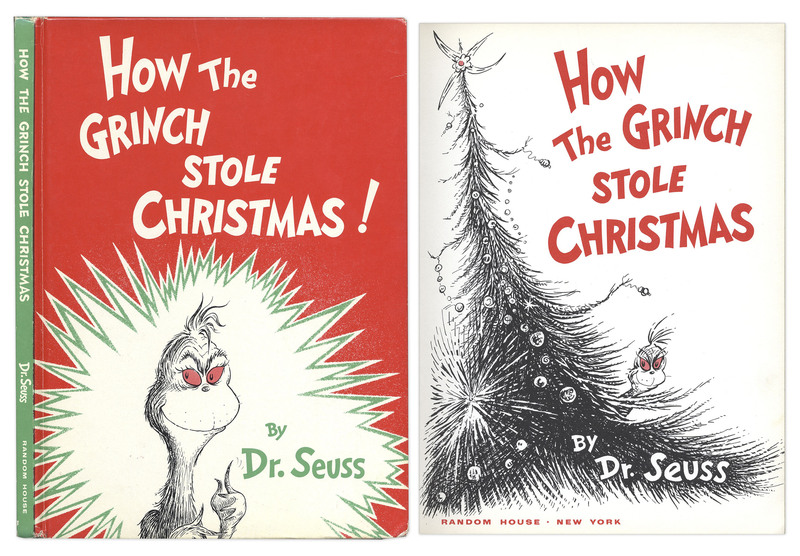 Seuss doesn’t mess around – in fact he goes straight for mother load, creating a mashup of the festive urtexts, A Christmas Carol and the Night Before Christmas. The Grinch is like a manic version of Scrooge who has forgotten to take his medication. He is driven mad by the people around him, the Whos, with their love of Christmas and their toys and their NOISE! ‘Oh the noise! Oh, the Noise! Noise! Noise! Noise! His journey, like Scrooge’s is one of redemption, but it reads like a descent into madness. He begins a hermit, disheveled and paranoid before his hatred for people and fun kicks in and he becomes something altogether scarier. Around the whole room and he took every present. Popguns! And bicycles! Roller skates! Drums! And then everything is stripped away, and the Grinch takes his load to the top of the nearest mountain where he can revel in the peace. In this moment of stillness he hears the locals who are singing anyway, despite being robbed blind. The Grinch is reborn. The nihilistic void he has created in everybody’s life is suddenly filled with love. After the mania that has gone before, it is a sudden, shocking reversal. A beautifully cathartic moment in this masterpiece of Christmas. Tags: A Christmas Carol, Dr Seuss, green eggs and ham, how the grinch stole christmas, the cat in the hat, The Night Before Christmas. Bookmark the permalink. Thanks for your wonderful blog ! I live in Paris and even in such a big city, it’s sometimes difficult to find a good selection of anglophone picture books. Thanks to you I’ve discovered many gems ! Glad your enjoying it so much, hope you can get your hands on some of the books!